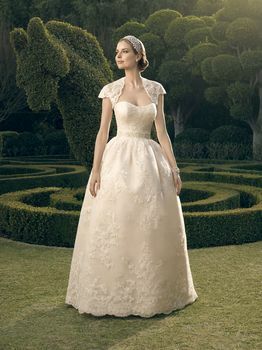 This versatile gown can be worn with the detachable short sleeve bolero jacket, or worn without for a strapless look. The bodice and skirt feature all over non-beaded embroidered appliqués over a layer of metallic embroidery on organza over Sleek Satin. The bodice has a modified sweetheart neckline and is accented with a beaded, eyelash fringe scalloped lace appliqué band that sits at the natural waist of this vintage ball gown skirt. Crystal buttons finish the bodice.